We offer many sizes of belts under the classification of Small, Medium, and Large Heavy Duty Belts shipped to you in 1 - 3 days normally! Select the size you need from the drop down menu (press the right check mark to reveal the menu) and click the size and diminsion belt you want to order. Then click the ADD TO CART or credit card button to place that belt in your shopping cart now including Shipping as indicated plus Handling on the total order added for a final total price (less possible 6.75% or current Texas state tax if you are a resident of Texas). If you wish to order two belts to save on shipping then click that appropriate ADD TO CART or credit card button UNDER the single belt selection. Get the numbers off the belt, measure the belt length and width, count the number of teeth, compare the type of teeth to the pictures of XL and HTD type belts, measure your scooter per our instructions, look at the belt chart we provide of manufactured and available sizes and diminsions (including the number of teeth per belt), compare your information with our belt numbers and specifics on the drop down menus, and/or email us your information so we can help BEFORE you order. 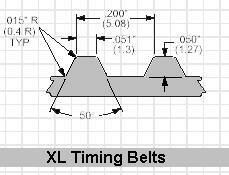 OTHER WAYS BELT NUMBERS CAN BE EXPRESSED A belt part number may be juggled such that they may appear in a different order than belt style, length, pitch, and width. A QB HTD 600-5M15 belt on our drop down order menu is the same as a QB-HTD5-0600-15 which reflects the style, pitch, length, and width in millimeters. The belt chart reflects the latter as the belt number. SCOOTER MODEL BELTS. See our CUSTOMER FEEDBACK BELT LIST of scooter belt numbers that match up with many scooter models, and also see our INTERNET SOURCED BELT LISTING page of information for other scooter models. Please do not order if you are unsure of the size you need. NOTE: We cannot accept returns, give credit, or make exchanges for belts purchased in error. Let us help if you are unsure BEFORE you order. See our ORDER FAQ. 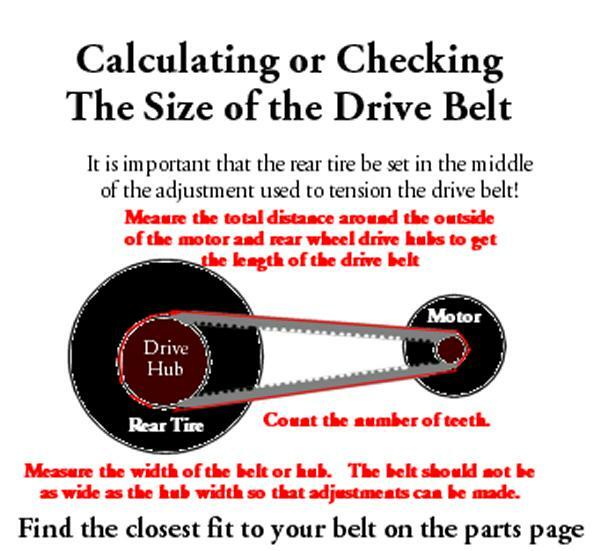 The following listing was provided by customer feedback and you should still measure your belt if there is no part number on it, count the number of teeth, and compare the type of teeth to the pictures of XL and HTD type belts. Also see our BELT LISTING page from internet belt information sources for other scooter models. HTD 700-5M18 drive belt fits Scoobug scooters; HTD 740-5M18 drive belt fits newer X-treme X-400 scooters; HTD 670-5M20 for Bladez Ion 150; HTD 612-3M12 or HTD 600-3M9 drive Belt fits Silver Bomber scooter and others; HTD 600-5M15 drive Belt fits many Rad2Go scooter models, X-Treme X250, and many others; HTD 575-5M15 drive Belt fits the Street Cruiser scooter, Star II e-scooter, and others; HTD 550-5M15 or 560-5M15 drive Belt fits the Vapor Scooter, the Razor E200 scooter, and others; XL 0180-037 drive Belt fits the Kysor Jet scooter and others; HTD 475-5M12 drive Belt fits the Exodus X8 scooter and others; HTD 447-3M12 fits the Razor E100 or Lazor E100 and others; HTD 420-3M12 fits the X-treme X-140; HTD 399-3M12 drive Belt fits the Step 'n Go scooter, Master Shine, and others; 384-3M12 drive Belt fits the X-Treme X-10, Alpha scooter, Step 'n Go scooter, Master Shine, and others; XL 0140-035 fits Sharper Image X2. See the Belt Chart for more details on sizes of belts that may be available. Note that belt part numbers may be juggled such that they may appear in a different order than belt style, length, pitch, and width. 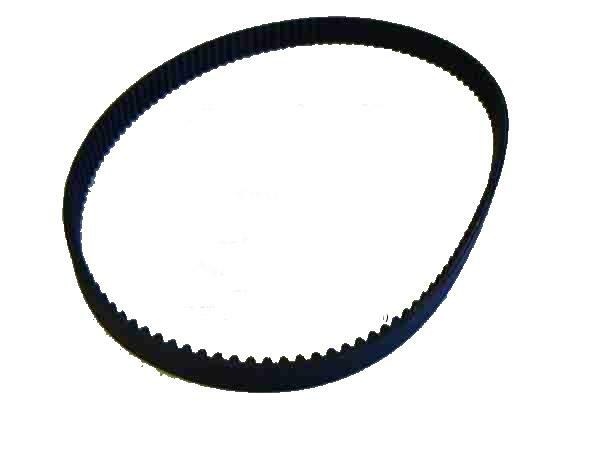 A HTD 600-5M15 drive belt on our drop down order menu is the same as a QB-HTD5-0600-15 from the drive Belt Chart which reflects the style, pitch, length, and width in millimeters. When electric scooters first became popular our Drive Belts, Throttles, Controllers, Control Boxes, Battery Chargers, Batteries, Brake Levers, Switches, Key Switches, On Off and Kill Switches, Fuses and Fuseholders, Lighting and Signals, and Common Scooter Electrical Components were available for customers in need who otherwise could not get parts for their model scooters. Electrical Scooter throttles, battery chargers, control boxes were very hard to find, and still are for quality parts. The difference in our electrical parts from others' electrical scooter parts is that we reject the cheap parts sometimes available to us. Plus, we test the electrical parts we sell prior to shipping them to our customers, adding a little bit to the price but insuring quality. Bottom line - fast receipt of quality electrical scooter parts!